This is it! Today is the day you start building your habit of playing guitar every day and becoming the guitarist you see in your imagination. Main Task: Learn how to properly hold the guitar. The guitar can be placed on either leg, but the right leg is most common. Classical players tend to play on the left leg. The headstock of the guitar should be nearly shoulder level. Your strumming hand comes over the top corner of the lower part of the guitar. Your fretting hand thumb should be on the back of the neck, flat, and roughly pointed towards the ceiling. The body of the guitar should sit at stomach level. The headstock should be at shoulder level. Main Task: Do stretches and warmups to prepare you for playing efficiently and without injury. Holding the guitar correctly as you learned yesterday, can go a long way to keeping your hands and wrists healthy. Today you’ll learn a quick little stretch to get your hands and wrists moving. Then we’ll do a little warm up exercise to get your fingers on the guitar. Put your left arm straight out with your palm facing out in a “Stop!” pose. With your right hand, gently pull back on the fingers of your left hand. You’ll feel the stretch on the bottom of your wrist. With your left arm still straight out, bend your wrist down to point your fingers toward the floor. Again, gently pull back on your fingers with your right hand. You’ll feel the stretch on the top of your arm. Repeat the process to stretch your right hand and wrist. Put both your hands up in a “stick ‘em up!” pose. Stay bent at your elbows so your hands are next to your head. Bend forward at both wrists and rotate your hands in a circle. Yeah, it looks and feels a little ridiculous. But it will help keep you from getting Carpal Tunnel Syndrome and Tendonitis when you start playing a lot. Frets are the little metal strips on the neck of the guitar. You’ll press the string down against the frets to change notes. And be sure to use the tip of your finger rather than the pad, especially when we get to playing chords. This is a simple warmup that’s still my first go-to when I’m getting ready to play. Start on your bottom string (the thickest one) with your first (index) finger at the first fret. Place your finger as close to the fret wire as you can without being on top of it. Pluck that note with your pick. Repeat 1-2-3-4 on each string going up to the top (thinnest) string. Do that on each string until you get back to the bottom. Tip: Go slow and make sure that each note sounds clean with no buzzing. Main Task: Today you need to simply watch this video for “Dead Flowers” by the Rolling Stones. Watch Mick Jagger closely as you’ll be playing his part of the song. Easy, right? And now you’re rarin’ to go. Tomorrow we start in with your first chord! Main Task: Learn the D Major chord. The fastest way to learn a new chord voicing is with a neck chart. Today you’ll learn D major, a chord we’ll be using in “Dead Flowers”. 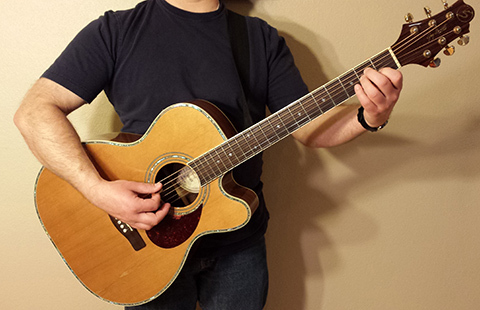 An “o” above the string (like on the 4th string above) means you’ll strum that string open with no fingers on it. An “x” means don’t strum that string as part of this chord at all. Pick each of the four strings in the chord to make sure they’re all coming out clean and clear. Be patient with yourself. You’re developing tiny muscle memories that will serve you for a lifetime of guitar playing. But they don’t always come immediately. Main Task: Strum quarter notes on a D Major chord. 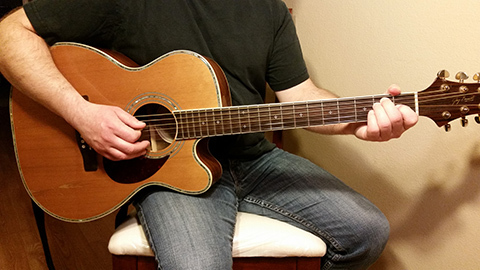 Today you’ll learn how to strum a simple rhythm with your D Major chord you learned yesterday. Tap your foot on the floor evenly, just like when you were listening to the song on Day 3. Count your foot taps, one beat each time your foot hits the floor. 1-2-3-4. Now, with your D Major chord, strum the chord four times, matching your foot taps and counting the beats out loud. Strum with downstrokes, i.e. with your pick heading towards the floor. Loop that pattern in sequence to keep the groove going. 1-2-3-4-1-2-3-4-1-2-3-4. Don’t pause at the end of each bar. Just keep on going, tapping your foot evenly just like when you were listening to the song. Side note: The notation used above is called “slash notation”. It only communicates rhythm and no pitch. Regular note have a round head instead of the diagonal bar. We’ll get there, but those are for later. Main Task: Learn the A Major chord. Today we’ll learn the second chord of “Dead Flowers”, A Major. Pick each of the five strings in the chord to make sure they’re all coming out clean and clear. Main Task: Strum D Major and A Major on quarter notes back and forth for one measure each without missing any beats. Today you’ll practice moving between your two chords on a quarter note rhythm like you learned on Day 5. Start with your D major chord and strum one measure (4 beats) of quarter notes on it. Then switch to A major and do the same. Your goal is to not stop the rhythm in between chords. Practice going back and forth between D major and A major until you can do it smoothly and without losing any beats. 1. Practice moving between the two chords with no strumming so you can concentrate just on your fretting hand. Close your eyes and repeat the same move from Step 1. By closing your eyes you’re forcing your brain to divert more concentration to your senses of touch and hearing. Open your eyes. Now, while switching between the two chords, tap the body of your guitar with your strumming hand in a quarter note rhythm. One measure for each chord. Now do the full movement. You’ll strum 4 quarter notes on each chord and move back and forth between D and A. Try not to pause when you change chords. Keep your strumming hand moving. VERY IMPORTANT! Force your strumming hand to maintain the rhythm even if your fretting hand isn’t secure on the chord yet. You’ll have some mangled chords on the first beat or so, but that’s ok. That will start to clean up quickly.Here’s the theory behind this idea. 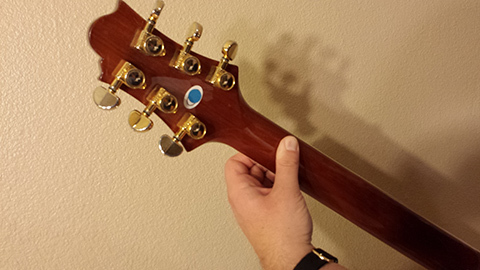 When your strumming hand stops, it gives your fretting hand permission to move slower. Your hands want to move in sync. So if your strumming hand stays on the groove, your fretting hand will move faster to stay with it. In the process of learning guitar, you’ll make mistakes. The trick is to make the right mistakes. Some are easier to fix than others. In this case, it’s much easier to fix mangled chords in your fretting hand than it is to break the habit of stopping your strumming hand. So make sure to keep that strumming hand moving. Watch your email for your Week 2 tasks!